GrainSense is a hand-held device used for Grain protein and moisture analysis in the field, the first truly portable and affordable device for farmers. GrainSense helps farmers to make complicated and cost-effective decisions with easily obtainable data - A laboratory in the hands of every farmer! Farmers can now have the capability of fast on-farm segregation of high and low quality grains during harvest, and make confident decisions within seconds. Oil – The number to know for oil seed farmers! Scan in the field and results are sent to your mobile phone. 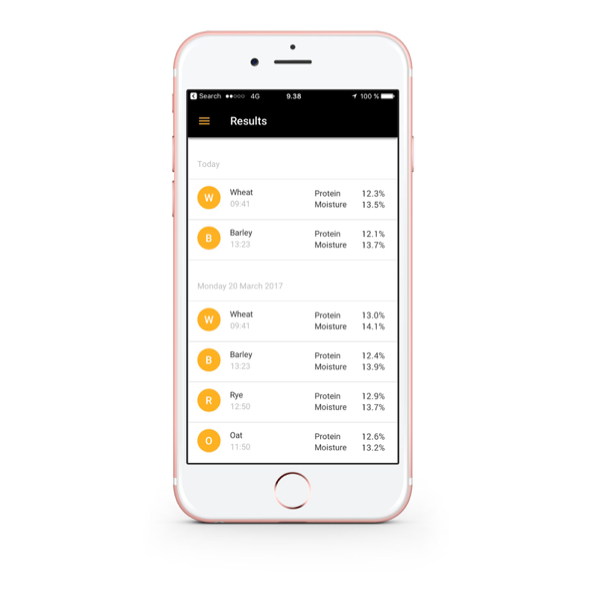 Using the GrainSense app (available on iOS and android on yearly subscription) results can be seen, stored and exported in an excel format. Manage your farm, storage sheds and silos based on real data online using the farmer dashboard, which allows farmers to pin point exactly where each analysis was taken from. Have confidence in your analysis, and know where and who to sell your product too, and at what price! Designed to help farmers make important, fast decisions at harvest time - “What order shall I harvest? Which field first?” resulting in the instrument being paid for in the first season! Subscription to the app and cloud services is done annually. "Being responsible for our farms operations, encompassing 1.500 hectares and up to 10 employees, I see valuable use in GrainSense. On top of our own laboratory measurement equipment that we have used for years now, I see clear benefits in using GrainSense in our daily operations. Getting instantly a more accurate insight in our produce and outcome." "I am a grain and oilseed farmer and a contractor using precision farming technology in nitrogen application. In my view Grainsense brings great opportunity to adjust nitrogen application to reach target protein levels with less input. In the future measuring green kernels before application will help to adjust nitrogen levels before harvest. This is important to me as a grain farmer but also to my contracting clients. Many of my clients also have poultry and pig productions. Reaching target protein means better price for grain farmer and less mixing components for meat and milk producers."